"[Hector] Berlioz's own compositions breathed the unmistakable spirit of Roman­ticism, the new artistic movement that reacted to the rationalism of the Enlightenment by emphasizing the emotions, the exotic and the wild. Their themes encompassed not only a Byronic hero's encounter with brig­ands and his experiences wandering alone in the mountains (Harold in Italy, 1834), but also, in another Byronic piece, The Corsair (1844), the world of the Mediterranean pirate; and in the Symphonie Fantastique (1830) the drug-induced dreams of an artist, including a 'March to the Scaffold' and 'Witches' Sabbath'. A number of early Romantic works were written under the influence of opium, including, famously, the poem Kubla Khan (1816) by Samuel Taylor Coleridge (1772-1834), who became a serious addict, consuming up to four quarts of laudanum (tincture of opium) a week. The drug's impact was recorded in detail by Thomas de Quincey (1785-1859) in his Confessions of an English Opium Eater (1821). Opium distorted perceptions of time and space and heightened emotional experi­ence, something that strengthened its appeal to the Romantics. Whereas the Enlightenment had stressed the need to subordinate the emotions to the intellect, Romanticism instead stressed feeling as the fundamental source of truth and authenticity and their expression in art. 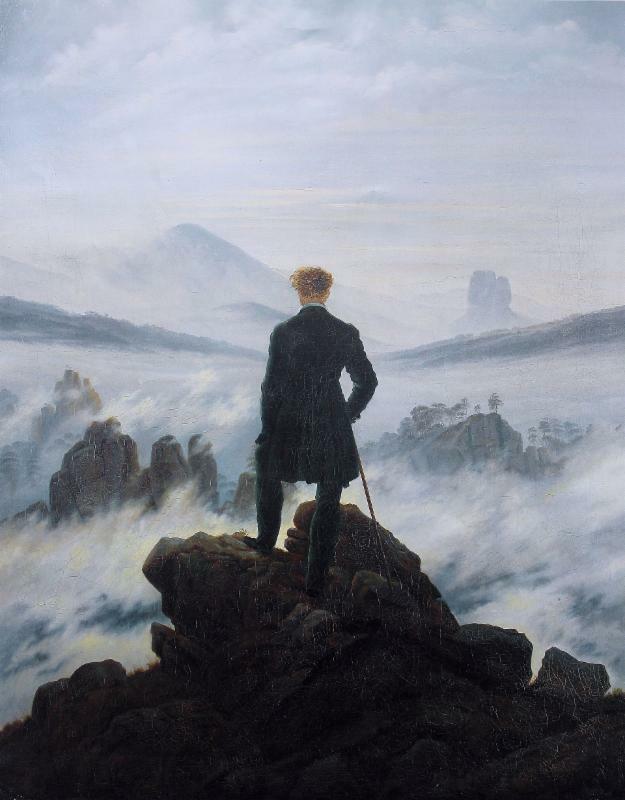 "The characteristic Romantic figure was a lone individual such as the Wanderer above a Sea of Fog (1818) by the German painter Caspar David Friedrich (1774-1840), standing on a mountain top above a sublime landscape after conquering its peaks, and, with his back turned to the viewer, contemplating an unknown and uncertain future, perhaps in the next life. The idea of the tortured genius was central to this ideal of art: art and suffering were intertwined in the Romantic agony in the figure of Beethoven, who was afflicted by increasing deafness from his mid-twenties until he had lost all his hearing by 1814. ... Beethoven was a transitional figure, beginning firmly in the Classical tradition and break­ing free of it in his late works, whose inspiration followed Romantic principles by eschewing rule-bound forms (for example, in the number and length of different movements) and expressing emotion in seemingly spontaneous and unfettered fashion.